After a quick stop at the park on our arrival day, we were prepared to be underwhelmed by our stop here. The park itself is OK, but nothing so dramatic as other national parks: the badlands are several steps down from Badlands National Park; the Little Missouri River that winds its way through the area is just an unimpressive little river, cloudy from the eroding clay soils; the wildlife is not as plentiful nor as extraordinary as what one might see at Yellowstone or Custer State Park; and even as a tribute to Teddy Roosevelt, the park is not as successful as Mt. Rushmore. But our assessment changed when we explored the park more thoroughly. 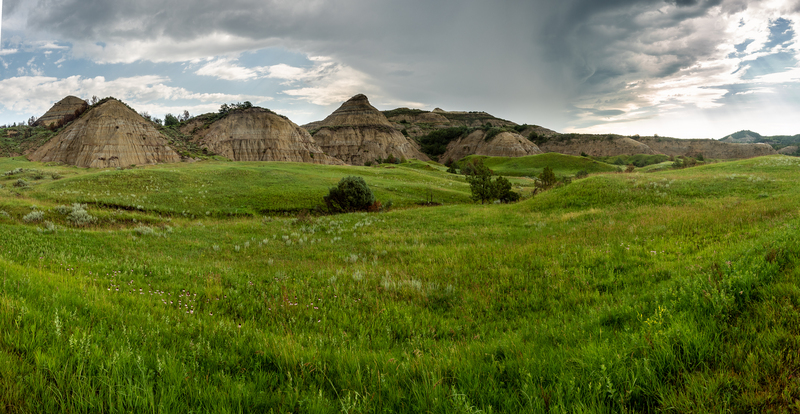 The eroded sandstone and clay mounds seemed to rise straight up out of lush green grasslands, enhanced by an unusually wet spring and early summer, and presented a beauty unlike anything we had ever seen. A pesky rain cloud seemed to follow us around for the first couple hours of touring the park. From atop Buck Hill, it almost looks as if a green carpet had been applied to the landscape, cut away where the clay features intrude on the surface. 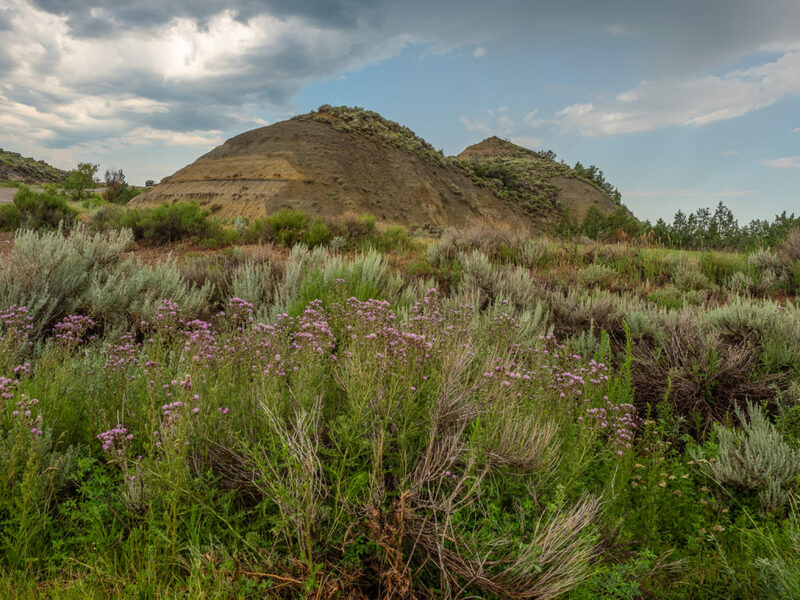 In areas dominated by sage brush, wildflowers were common. And wildlife, while not common, was plentiful enough that the bison were able to occupy the roadways and tie up traffic. And our stop here did validate the essential connection between this area and Roosevelt’s conservation philosophy. Roosevelt was in many ways the father of the conservation movement in the United States and it is often said that to understand his approach, one must see the badlands of North Dakota, where he not only briefly ventured into a ranching business, but where he began to formulate his idea that the natural resources of our country were precious, exhaustible, and subject to over-exploitation. Having been here, we understand the point. Roosevelt believed that, without moral or legal constraints, the very same human tendencies that propelled mankind to greatness would inevitably tend to excess and destroy the foundation on which they were built. His hallmark achievement as a trust-buster, for example, is a perfect illustration. As Morris points out in Theodore Rex, Roosevelt admired the great captains of industry and what they accomplished: they built railroads that spanned a continent, a steel industry unmatched in the world, and a financial structure that could leverage capital and fund the expansion of an entire nation. But at some point, something of an uncontrolled chain reaction had taken place in those institutions. The economic impulses that led to their greatest success couldn’t stop themselves and they began to consume the social foundation on which they were built. The “freedom” that a free market provided allowed the industrial giants, through trusts and combinations, to turn their power towards the market itself. Roosevelt came to believe that the energy of commerce, like fire, was a valuable servant but a terrible master. Roosevelt saw a similar effect when it came to natural resources. As he said, “We have become great because of the lavish use of our resources. But the time has come to inquire seriously what will happen when our forests are gone, when the coal, the iron, the oil, and the gas are exhausted, when the soils have still further impoverished and washed into the streams, polluting the rivers, denuding the fields and obstructing navigation.” The productive use of resources, in essence, because it was not self-constraining, contained the seeds not only of its own destruction but of society’s loss as well. It would be hard not to come to such a conclusion in the plains of 19th century North Dakota. 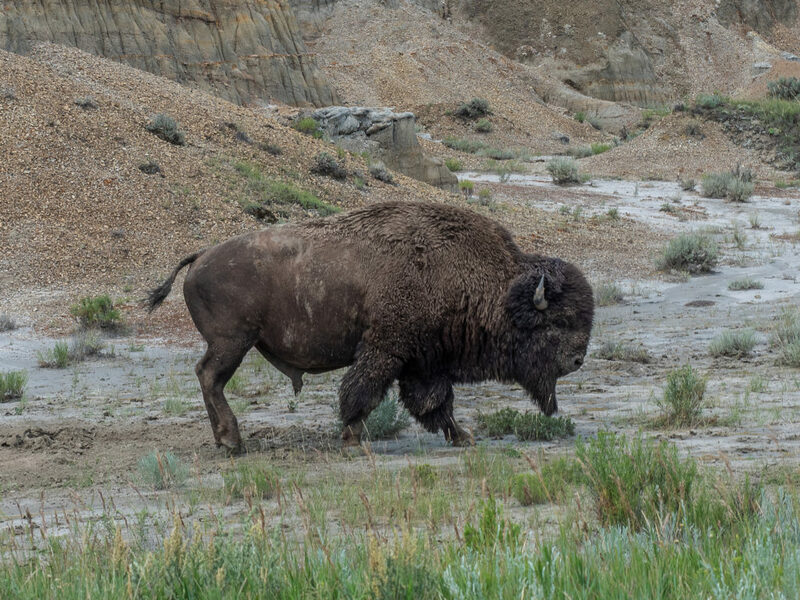 Bison, which may have numbered across the country as many as sixty million, had been decimated and now numbered only a few thousand. On his bison hunt to this area in September 1883, bison had become so scarce that it took Roosevelt ten days to bag one. 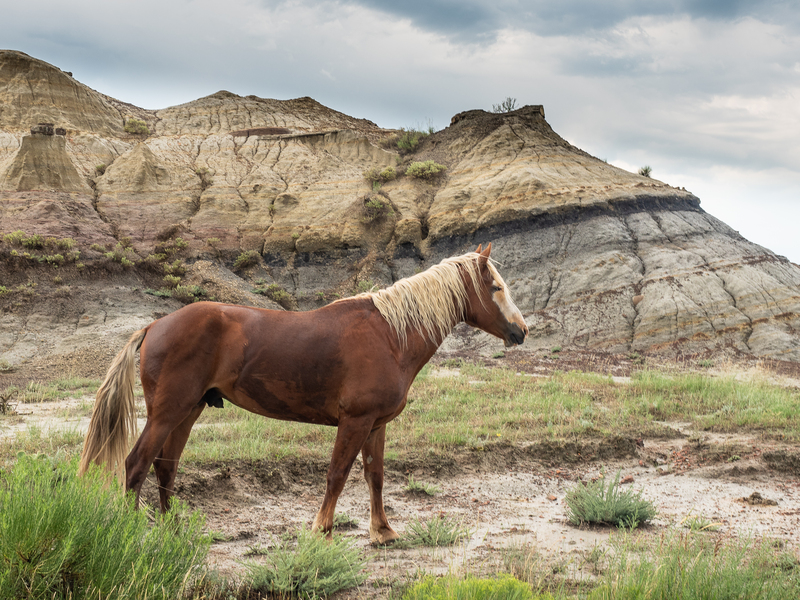 Ranchers, enticed by the grasslands, were streaming to the area in such numbers that the landscape was overgrazed and denuded. Although it would be a century before the concept of the “tragedy of the commons” would be articulated, Roosevelt could see it happening before his eyes. The truth that nature can be used only up to a point before it can no longer recover is inescapable in the severe environment of the North Dakota badlands. One can read into Roosevelt’s philosophy a sort of incipient Sierra Clubophilia, but that would be a mistake. Morris points out that, in Rossevelt’s famous trip to Yosemite with John Muir, Roosevelt was uncomfortable with Muir’s preservationist philosophy and much preferred the scientific management principles for forests espoused by his good friend, Gifford Pinchot. Roosevelt considered one of his most important environmental achievements to be the Newlands Reclamation Act of 1902, which provided for the construction of dams and irrigation projects throughout the west. Roosevelt believed that, “water in western rivers, if not being used to help people, was wasted,” a phrase that would be anathema to card-carrying Sierra Clubistas. Roosevelt was an avid hunter, something that would make a PETAcrat throw up, and not only supported a widespread ranching industry, to the same PETAcrat effect, he participated in it himself. 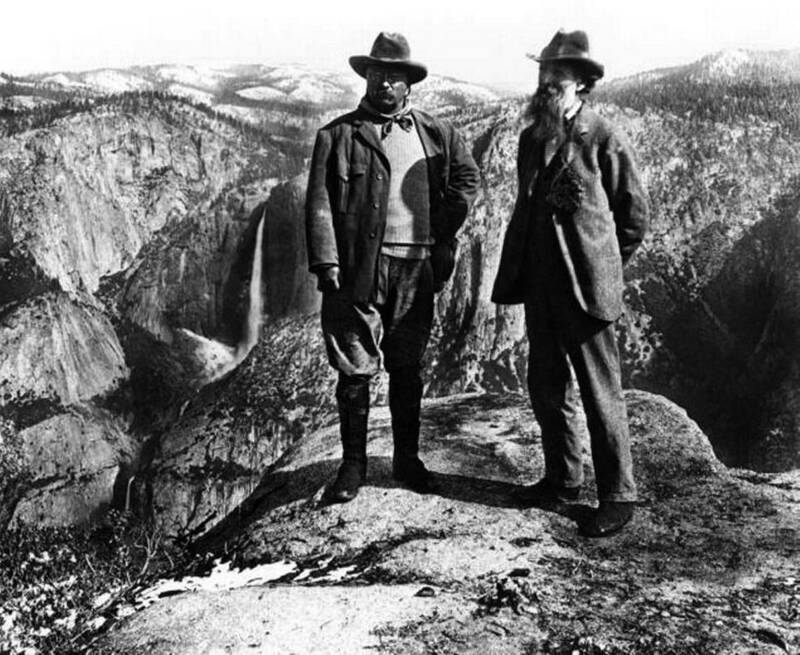 Roosevelt with John Muir in Yosemite in 1903. Although Yosemite had already been largely protected, Roosevelt’s trip to this area reinforced his view that some areas of the country had to be preserved for future generations. So Roosevelt came to believe in a conservation philosophy that was balanced and dualistic: beneficial use on the one hand and preservation on the other; scientific exploitation of resources that were renewable and manageable, and binding perpetuation for resources that were unique and irreplaceable. 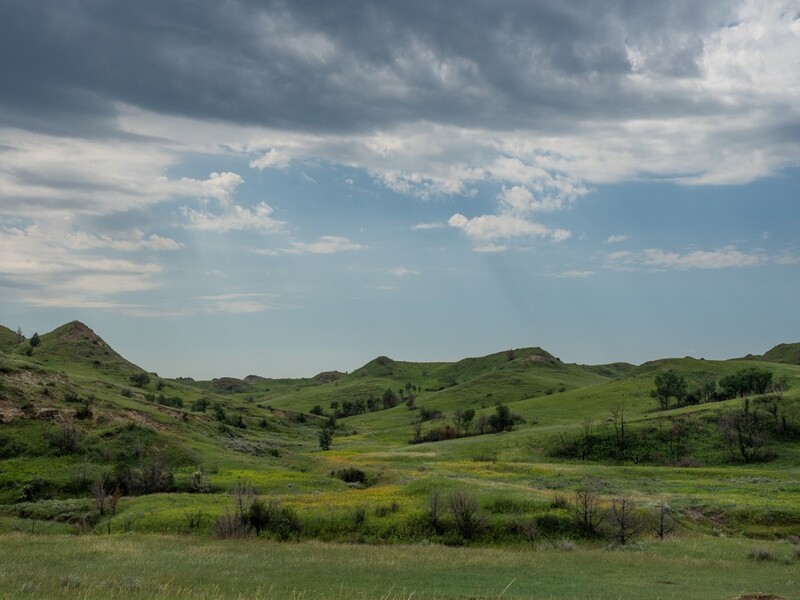 Such would be a natural and essentially inevitable conclusion for a hunter and rancher in 19th century North Dakota, which is why it is worthwhile to see the place of the formative years for Roosevelt’s conservation convictions. From these underpinnings, Roosevelt’s conservation accomplishments were impressive: while in office, he set aside over 230 million federal acres for conservation, a quantity of land greater than the entire state of Texas. He signed and invoked the Antiquities Act that allowed for preservation of land as “national monuments.” He established 150 National Forests, 23 National Parks and Monuments, 51 federal Bird Reserves, four national Game Preserves, and 24 reclamation projects. So, this ends this year’s summer excursion. We now start the long (1800 mile) (this is a BIG country!) trip home. This entry was posted in Deep Thoughts, Travels on July 10, 2018 by skiprd.